Nothing is more important to a successful steam locomotive restoration than having the infrastructure to restore, maintain and operate the engine. The Steamtown National Historic Site, provides a world-class facility for the rebuilding and operation of #3713 while regional Scranton rail lines give her plenty of places to run. Rebuilding small steam locomotives can be accomplished in tight confines, but bringing a large mainline locomotive back to life requires an extensive shop with plenty of room. 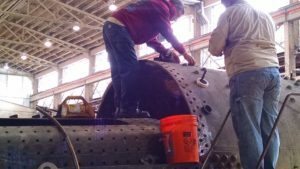 Overhead cranes, under-track access pits and heavy machinery built for the specific needs of steam locomotives are tools of trade in the world of railroad preservation. The Steamtown National Historic Site includes shop buildings original to the Delaware, Lackawanna & Western Railroad. 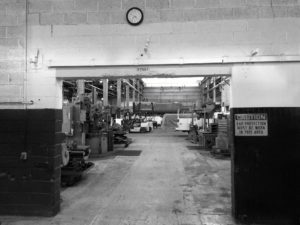 The facility was built to accommodate the core elements needed for overhauling large railroad equipment. Steamtown NHS has augmented the inherent benefits of the shop buildings with specialized tools and machinery designed for railroad and heavy industrial work. With a well-equipped backshop and trained restoration experts, the Steamtown National Historic Site offers a native environment for rebuilding and maintaining large steam locomotives. A fleet of historic passenger cars await the visitors who will come to experience trips behind #3713 on the former mainline of the Delaware, Lackawanna & Western Railroad which tunnels, curves and claws its way across the Pocono Mountains as part of the county-owned rail system upon which Steamtown NHS operates. #3713 will continue to be worked on in this properly-appointed, year-round and indoor environment. While heavy repairs are done in shop buildings, a restored steam locomotive in regular service needs an entirely different environment for its day-to-day service. The Steamtown National Historic Site features a large roundhouse equipped for the daily housing, care and servicing a locomotive requires. This work can take place indoors in all seasons. Adjacent to the roundhouse is a functioning turntable used to turn locomotives and to guide them to the proper tracks in the roundhouse complex. Coal and water loading areas, ash dumps and other essential elements for supporting operation of #3713 are in place and ready to be used. The Steamtown NHS infrastructure also restores and maintains a fleet of steam-era passenger cars used for regular excursions. These cars will be hauled by #3713 upon completion. No additional infrastructure will be required to support #3713. During the the peak of its industrial might in the early 1900‘s, Scranton, Pennsylvania was served by five major railroads. Main arteries connected the city to New York Harbor, Buffalo, Chicago and Montreal; while webs of branchlines sought every source of coal, iron and manufactured goods that the area had to offer. Over a hundred years later rail lines adjacent to Steamtown NHS still connect Scranton to the northeast. Regional service is provided on a core network of routes purchased by Lackawanna and Monroe counties late in the last century. One of the county-owned routes is the former mainline of the Delaware, Lackawanna & Western Railroad which once tied Scranton to the ports of Hoboken, NJ and Buffalo, NY. Today, this historic route still tunnels, curves and claws its way across the Pocono Mountains as a well-maintained active freight line. It is also the main route over which Steamtown NHS operates. Excursions over the former DL&W range from 26 mile round-trips to Moscow, PA to day-long outings to the Delaware Water Gap (Project 3713 partner L&WV RHS operates the historic depot complex at Moscow, PA). Steamtown NHS also operates specially-scheduled excursions over the county’s former Delaware & Hudson route to Carbondale. With an excursion program already in place, #3713 has railroad ready and waiting for her.